Google have finally lifted the lid on their cloud gaming platform, Google Stadia. Promising instant access to massive games including Assassin’s Creed Odyssey and Doom Eternal simply by clicking a link in your Chrome browser, Google Stadia aims to make download times and hardware upgrades (and apparently my job) a thing of the past when it launches later this year. Here’s everything we know so far. You may recall that Google dabbled with cloud gaming late last year as part of their Project Stream service. While it wasn’t ever available in the UK, those in the US were able to stream Assassin’s Creed Odyssey at up to 1920×1080 at 60fps, and judging by the response from those who did get to try it out, it was pretty darn impressive. Well, it turns out that was all a sneaky test for Stadia, Google’s all-new cloud gaming platform. While the name doesn’t exactly scream ‘GAMES’, it’s based on the idea of – yep, you guessed it – a stadium where everyone can gather to watch their favourite, bestest best past time. And from the looks of things, it could be one of the most extraordinary bits of cloud gaming tech I’ve ever seen. At launch, for example, Google say Stadia will be able to offer 4K gaming at up to 60fps, as well as HDR and surround sound, with the view to stream at 8K resolutions and 120fps further down the line. Heavens knows what kind of internet connection you’ll need for that, but it’s the ease with which you’ll be able to do all of that that makes Stadia so intriguing. Imagine, for example, you’re watching a trailer for Assassin’s Creed Odyssey on Ubisoft’s official YouTube channel. At the end of the trailer, you’ll then see a ‘Play Now’ button. Click on it, and you’ll be able to play the game instantly, no download or patch required, in as little as five seconds, Google’s Phil Harrison told attendees at GDC. It’s not just YouTube where you’ll find these Play Now buttons either. There will also be a dedicated Stadia Store and Stadia Player where you’ll be able to launch your games from, but any link will work, too, whether it’s from a Google search result, Twitter, Facebook, Reddit, Discord, a text message, or even the Google Play Store. And if you’re worried about your kiddy-winks accessing inappropriate games shared to them by their mates, worry not, for Google will be including a variety of parental controls as well that let you say who they play with, what they play and when they play. Stadia will also run across multiple devices, allowing you to instantly switch between different screens as and when it’s convenient. 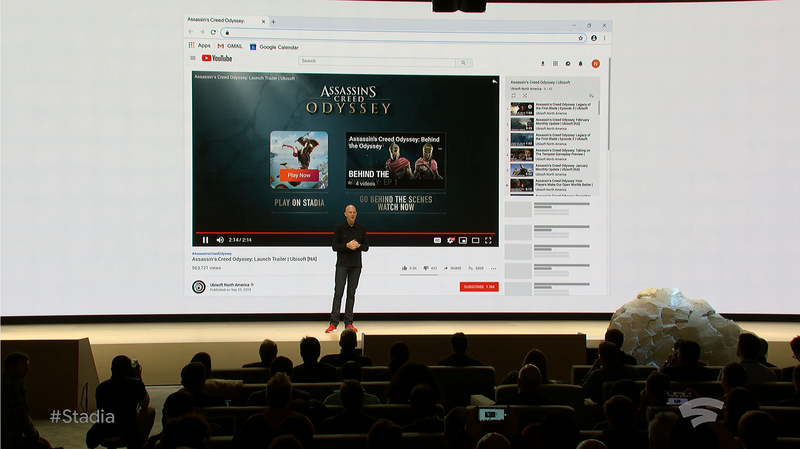 During the presentation, they demonstrated the tech running across a laptop, low-powered desktop, a phone, tablet and TV all in turn, with Assassin’s Creed Odyssey transferring seamlessly across every device. This isn’t the first cloud gaming service to do this kind of instantaneous device hopping, of course, as Blade’s Shadow tech does a very similar thing as well, allowing you to jump from cloud gaming on a PC to your phone and tablet and certain TVs via their own Shadow app. But Shadow is also an entire virtual PC in the cloud. Stadia, on the other hand, is all about games. Stadia also hopes to make multiplayer experiences better as well. Traditionally, clients and servers are connected together over the internet, and will often be limited by the person with the poorest connection. With Stadia, however, the client and server remain on Google’s data centre, creating a more uniform experience overall. Google says it will also be more secure, since nothing ever touches the public internet, and it should also create a more predictable environment for developers that’s able to scale to heights yet unseen – or perhaps only hinted at with tools like Improbable’s Spatial OS – allowing battle royales with hundreds of players today and thousands tomorrow. All without any cheating or hacking. And if that wasn’t enough, Stadia will fully embrace cross-platform play as well, according to Google. That includes the ability to migrate gameplay progression and save files, too. 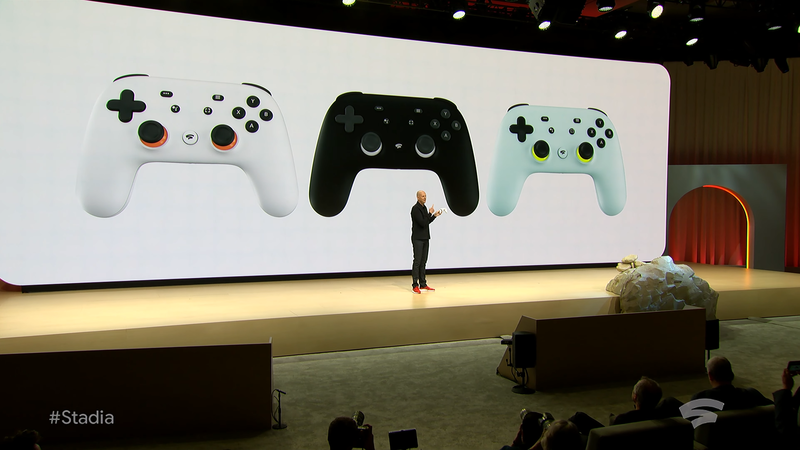 What’s more, you don’t even have to use the new Stadia controller Google will be peddling with it when it launches. Nope, you can also use it with your own mouse and keyboard, or existing USB controllers you already own when playing on a laptop or PC. You will have to use it when playing on TVs, tablets and phones, though, but it does bring with it some important advantages. For instance, it’s able to connect directly to the game running in Google’s data server over Wi-Fi. It will also identify which screen you want to use, and link it to your game session running in the cloud. It also has a special sharing button for sticking your gameplay footage back out onto YouTube, as well as a dedicated Google Assistant button, which lets you access the built-in microphone to ask your controller questions about the game. As for the hardware behind Stadia, Google has partnered with AMD to create a custom GPU that can deliver 10.7 teraflops of power thanks to its 56 compute units and (currently unspecified amount of) HBM2 memory. By comparison, a PS4 Pro can deliver 4.2 teraflops of power, while the Xbox One X can produce 6.0 teraflops – making Stadia more powerful than both of these console boxes combined. Paired with another custom-built 2.7GHz CPU and 16GB of RAM, this is what makes up a single Google Stadia ‘instance’. And to get an idea of just how powerful a single Google Stadia instance is, Google and id Software not only confirmed that Doom Eternal will be running on one of these Stadia instances, but that it will be able to do so at 4K at 60fps with HDR turned on. Some games, however, will be able to run on multiple Stadia instances, and to show what kind of difference this makes to overall performance, Google put 3D Mark’s Fire Strike demo to the test, showing what a single GPU looks like alongside several of them working together. 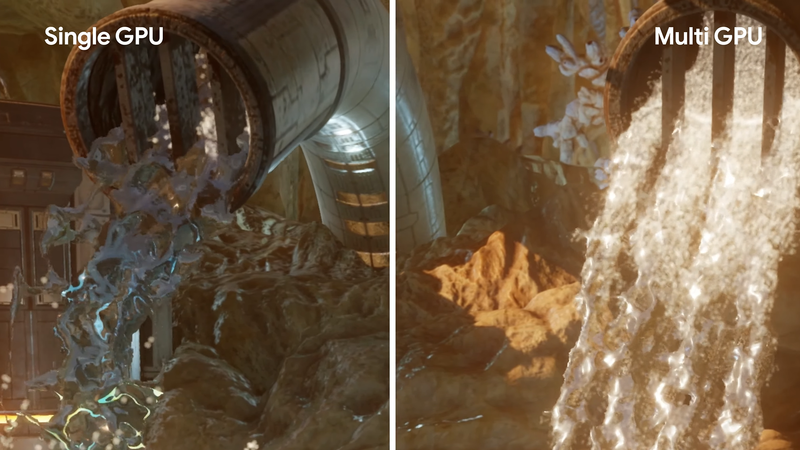 As you can see from the screen below, the biggest difference is the quality of the water, which Google say is one of the most graphically intense things you can do in a game. The platform as a whole, meanwhile, will run on Linux and use the open Vulkan API, but Stadia will also support Unreal Engine and Unity as well, plus dozens of other engines and middleware programs such as Havok, Umbra, Improbable’s Spatial OS, CryEngine, SimplyGon, Silicon Studio, CriWare and many more. The goal, after all, is to make the “most flexible development environment ever put together”, and it’s already in the hands of over 1000 creatives and engineers big and small. However, Google also announced that they’re forming their own first party game development studio, Stadia Games and Entertainment, which will be headed up by – yep, you’ve probably guessed this one, too – Jade Raymond, who recently left her long-time position at Ubisoft to join the search giant’s new gaming team. So when can you try Stadia out for yourself? Well, Google Stadia will be arriving later this year in 2019, and will be coming first to the US, UK, Canada and most of Europe. The only thing Google failed to mention was how much Stadia would cost, leaving a big question mark over just how accessible it will really be. Still, with more news coming in the summer about what games we can expect to play at launch, we hopefully won’t have to wait too long to find out.